The name conjures up thoughts of a beautiful alpine lake set high in the California Sierra-Nevada Mountains. Located on the California-Nevada border just west of Reno, Nevada, the lake is a year-round playground for the young at heart. For many, it is their winter skiing escape on some of the best slopes in the nation. For others, it is their summer weekend get-away. For those who live there year around, it is home. But for some pilots flying into the South Lake Tahoe (TVL) airport, it can be a potentially dangerous operation. According to several of the FAA's Reno Flight Standards District Office (FSDO) aviation safety inspectors I spoke with recently while working in Reno, Lake Tahoe airport can challenge the unprepared pilot landing and taking off at the airport. One of the safety inspectors here in Washington, who used to fly into the airport from the San Francisco Bay area before he joined the FAA, concurred with the Reno inspectors and added a few stories of his own. So why is FAA Aviation News writing about the Lake Tahoe area? The answer is while I was at the 2005 Reno Air Races in September; I asked the safety inspectors I was working with what were some of the 'hot' safety issues within their FSDO's area of responsibility. The Lake Tahoe airport was the first airport mentioned. Having flown in a glider over the mountain that forms the eastern shore of Lake Tahoe just days earlier, I could easily visualize the airport and its surrounding mountains. Based upon my flight and the inspectors comments, I realized the Lake Tahoe airport would be a great example the magazine could use to remind pilots of some of the risks involved in flying into an airport that might have significant geographical differences from their home airfield as well as a way to remind all pilots of the need to consider density altitude and resulting aircraft performance in their flight planning. Differences that, if not recognized and compensated for, could spell danger. Are we saying South Lake Tahoe is a dangerous airport? The answer is no. It is not. But as the safety inspectors pointed out, local pilots familiar with the area have no problem safely flying into and out of the airport. Those who are at risk are those pilots operating outside their normal operating area. The purpose of this article is to remind all pilots to be careful when operating into airports outside of their experience levels. 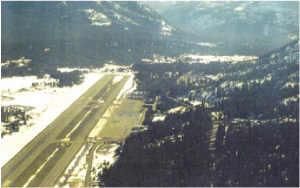 Located on the south end of Lake Tahoe, the airport is located 6,264 feet above mean sea level (MSL). Its single runway (18-36) is 8,544 feet long by 150 feet wide. For most general aviation pilots, such a runway should meet everyone's basic needs. But therein lies the problem. This is not your normal eight thousand plus foot long runway near sea level. It is 6,264 feet above sea level. According to the Reno safety inspectors, pilots taking off towards the south have a unique problem. There are mountains off the south end of the runway that tower up to more than 10,000 feet MSL. The rapidly rising terrain forms a restricting funnel that can trap the unwary pilot flying a marginally performing aircraft southbound. Add in the fact Lake Tahoe is surrounded by mountainous terrain that goes up to more than 10,000 on some nearby peaks, and you can begin to understand what makes Lake Tahoe so unique. When I searched the National Transportation Safety Board's (NTSB) aviation database for anything relating to Tahoe, the database returned 154 records dating back to 1964. This number may not be significant compared to other airports considering the fact the number covers more than a 40-year period. However, a quick review of some of the fatal accidents over that period reinforced what the FSDO inspectors had said. Although the NTSB database contained some of your typical aircraft accident causes such as engine failure and pilot error, many of the fatal Tahoe accidents I reviewed fit into three broad categories: density altitude and lack of aircraft performance, weather-related factors (such as turbulence, ice, snow, and reduced visibility), and rising terrain. In another fatal accident the report said the pilot departed the Sacramento, California, area and, while descending, flew into mountains obscured by clouds. This is the basic definition of a controlled flight into terrain type accident where the pilot continues VFR flight into adverse weather conditions. The Reno FSDO inspectors discussed the fact that weather conditions can change rapidly in the mountains and that pilots need to check and update their weather information when operating in such terrain and weather sensitive areas. They also mentioned icing was always a potential risk in the area during the late fall and winter. The Reno inspectors emphasized the importance of climbing over the golf course rather than continuing straight out of Runway 18. The danger is flying into the rising terrain that can box you in south of the airport. As noted in the other accident reports, an aircraft at or near gross weight may not be able to out climb the rising terrain in a high-density altitude situation. This is especially true if there is a descending mountain airflow coming off the mountain flowing down over the airport to Lake Tahoe. Lake Tahoe is not the only airport that may require a pilot to circle up to a minimum altitude before starting out on course in mountainous terrain. But the airport does serve as a good example of a resort airport that may attract pilots who may not be familiar with the terrain or the need to be able to operate their aircraft at its minimal performance level. Although not an accident, the following narration highlights the facts that not only are single-engine aircraft vulnerable to density altitude considerations when operating from the Lake Tahoe airport, but so are light twin-engine aircraft. Multiengine pilots need to remember that light twins are not required to demonstrate single-engine climb capability as part of their certification. The 2004 NASA ASRS report involved a Cessna 310 light twin departing from Lake Tahoe airport on a day VFR flight. The private pilot reported that shortly after takeoff in his 1960 Cessna 310, the right engine seemed to have lost partial power. The engine did not sputter or make any odd noise and did not quit entirely. The pilot said he flew over the lake at 20 feet above the water to try and build airspeed while flying in ground effect. He said he thought he could ditch the aircraft near enough to people to be rescued if he had to ditch it, because he knew the aircraft would not fly on only one engine. After several passes, he said the right engine regained power and he was able to climb to a safe altitude and return to the airport. The engine was inspected and ran fine later. He reported density altitude and the engine being too rich were probable causes. This narration illustrates the importance of pilots flying light, multi-engine aircraft to review their single-engine performance numbers before flying in the mountains as well as reviewing their aircraft's single-engine drift down numbers. In this pilot's case, he was able to resolve his problem over a large, flat lake rather than over rising terrain. But this case highlights the importance of careful preflight planning and being able to safely handle a potentially critical situation. So what is the answer? The following recommendations, the list is not all-inclusive, hopefully will challenge any pilot flying into a radically different operating environment to carefully review the area's operating requirements and the aircraft to be flown operating limitations and performance requirements. Contact the nearest Flight Standards District Office for advice in how to operate in the area. Contact the airport's manager or fixed base operator for advice. Review the NTSB database for any listed accidents and review those accidents for any particular type of accident. Review the appropriate airport chart or charts and any published data for the area to get an idea of the type of operating environment you will experience. Check with the appropriate state aeronautical organization for any unique operating requirements or advice. Review and learn your aircraft's operating limitations and performance data. If you are going into the mountains for the first time, plan on stopping before you go into the mountains for some local mountain training with an experienced and well-qualified mountain flight instructor. If density altitude will be a factor and if you have not calculated your aircraft's performance since your initial pilot certificate was issued, you might want to dust off your old student pilot manuals and run a few density altitude calculations. Then use those density altitude numbers to calculate your aircraft's expected performance numbers at that expected density altitude. You might want to check with your well-qualified local flight instructor on high altitude flight operations. If you are flying a light twin-engine aircraft, do you know its two engine operating limitations and its single-engine operating limitations? Since weather conditions in the mountains can change quickly, are you weather-wise about the area you plan on operating in? If instrument rated, are you current and proficient? If snow or ice may be encountered, are you prepared to divert to another airport if your aircraft is not certificated for known icing? Since aircraft weight has a direct bearing on its performance, have you reviewed your load and center of gravity calculations to ensure optimum performance under the expected conditions. Have you considered departing the high elevation airport with minimum safe fuel to reduce your aircraft's weight and then landing at an airport at a lower elevation to top off your tanks before continuing your trip? Have you considered making more than one trip with reduced loads out of a critical airport situation to reduce your risk and increase your aircraft's performance numbers rather than trying to take everyone and all their gear in one flight? Remember aircraft perform better in the cooler parts of the day such as early morning or near dusk. A few degrees in temperature may make the difference in a critical go/no-go situation. Remember turbulence is normally less early in the morning and later in the evening. Do you know how to make maximum performance turns in a small area in case you find yourself in a box canyon? Do you know how to use rising air currents, if available, to try and gain altitude in a critical operating situation? Do you remember the guidelines about approaching a mountain ridge at a 45 degree angle rather then straight on to make it easier to turn away from the ridgeline in case you decide you don't have enough altitude to make it over the ridge? Are you ready to make an off airport landing or controlled crash rather than risk a possible lose of control, stall, and spin type accident? Do you know your aircraft's recommended engine leaning procedure for high elevation operations? Finally, did you remember to reduce your aircraft's performance data to compensate for its age and wear and your possible less than test pilot skill level? These are just some of the ideas you might want to consider when flying into the mountains. Many of the ideas also apply if you are flying in other areas such as the desert, or in some cases, hot, humid coastal areas. Whether you are concerned about density altitude, not being able to climb out of ground effect, or weather related issues, it is important to make good decisions and to execute them in a timely manner. Accidents have occurred when a pilot decided to abort a takeoff or landing, but the decision to execute that maneuver occurred too late for the pilot to avoid an accident or incident. Either the aircraft ran off the runway or hit an object while trying to make a go-around. In some cases, there are airports in various parts of the United States where once a decision is made to land, the aircraft is committed to land. There is no go-around option because of terrain. So these types of airports demand special flight planning. But regardless of how careful you plan, aviation has certain inherent risks. The best insurance you can buy for your flight is to file a flight plan. If it is a VFR flight plan, you need to remember to activate it and later close it. IFR flight plans are normally activated by air traffic control, unless you are operating in a remote area where you may have to open and close your IFR flight plan. Remember the old saying, safety is no accident.